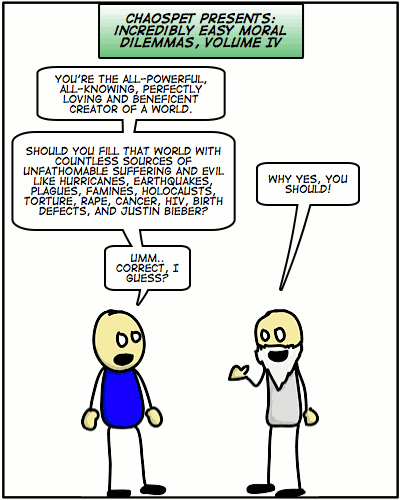 surely the Beiber is the antichrist or at least a harold of the apocalypse. his presence must open a gate or something. Wait… you put all those other things in the same sentence as Justin Bieber? That is awful! You make unfathomable evil sound worse than it is! Canuovea, I’m sorry, I know – I went a little too far with that one. On the one hand, there are all those evils. On the other hand, Chaospet sometimes updates. Clearly there is more good than evil in the world. Every deity I’ve personally interviewed approved. Per induction I conclude with high probability that there is no new comic published the 17th may. Since this looks like a new comic and what looks like a new comic is either a new comic or a fake new comic, I conclude that this is a fake new comic published the 17th may. wm, I do what I can. Emil shhh, that was supposed to be a secret.